Typical isn’t it? that just when you have finished trying your damnedest to express something difficult or personal or straight from your soul you find something or someone that does it better – and could have saved you all the trouble. In my earlier post about thinking time I struggled to express what someone is buying when they purchase a piece of original art. Well after I’d finished I came across this anonymous piece….which explains it a hell of a lot better. That’s what I meant to say! * OK. A couple of hours ago I was rabbiting on about time spent thinking during creativity and I asterisked something I meant to come back to on starting a painting – well this is what I wanted to share with you. Richard Diebenkorn the American artist used to keep a list of things to remember to help him “start” the ball rolling with a new painting, 10 things in all. I was relieved when I came across this because it laid bare for me the extreme difficulties even sometimes accomplished artists can experience when faced with the dreaded blank page. I share his list here with you in the altruistic spirit of helping any of my artist colleagues out there who could use it – quite a lot of us I should think. Take from it what you want, what you can understand or which means something to you and can help you. The pretty initial position which falls short of completeness is not to be valued – except as a stimulus for further moves. I suspect that some of these points would do well with an exclamation mark before them. But generally I think I feel rather than know what he means and it certainly helps me not to fall into the usual traps. Don’t profess to understand it all though, who for instance is Pollyanna? Sorry the asterisk in the last post is a reference to the problems of starting a painting I wanted to talk about but forgot. Will put it in my next post later today or tomorrow. How much time do you spend on creating? I was sat in the studio again the other day, in a bit of a daydream as I’m want to do. I was deep in thought as usual about 1. a piece of art I already had on the go, 2. another piece I was trying to start *, and 3. where all this was taking me artistically and in what direction I was trying to travel. Well so far so what you might think – and well you might – but an obvious thought struck me with more than usual force about my time actually spent in the physical creative process. No doubt many of you will at some point in time have had the same idea, and in fact so have I. I don’t know why on this occasion I was so taken aback just because of a sudden realisation how much creative time is devoted to thinking rather than(in my case) painting. I can tell you it’s huge! and I don’t mean time spent wondering what to paint. Oh no! choosing your next subject, as difficult as that sometimes is, pales into insignificance when you stand it up against the time spent considering and reconsidering, sometimes, every brushstroke once you have started. My record time for not finishing a painting is 15 years but I had the excuse at that time of just having become a father for the first time – and, well you know the rest. I just never seemed to recover my mojo after that – not until the kids had grown up somewhat. Do people actually realise what they are buying when they purchase a piece of original art? I don’t care who the artist is, or how prolific they are, to some extent the same thing will apply…..that they are actually purchasing a substantial portion of someone’s lifetime, considering the next brushstroke. Hell yes (to use a current term) so the art is expensive and so it should be when you consider it like that! I often find myself explaining that in terms of pricing I will never be able to sell a piece of work for the kind of sum that would even begin to pay me back for what I have put into it in the first place. So I am resigned to my art never being a viable proposition in real terms. How many other artists out there toil away under the same certainty of ultimate loss-making? Most I would venture to guess. So I arrive at the usual position I am in when I consider all this – why do I do it then? Well I will tell you why. It’s because I love doing it that’s why. That’s it! nothing else comes close to the overwhelming feeling I get when I am painting . 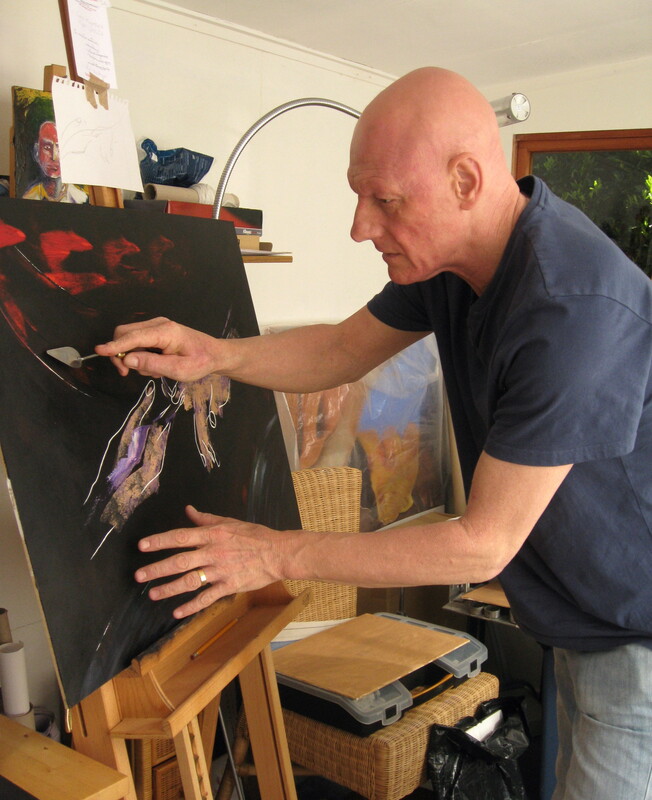 An intoxicating mixture of excitement, calm and fear – fear that I may never achieve what I want to get onto canvas, excitement that I am getting there and calm that whilst all this is happening I am in some kind of nirvana and so relaxed and away from the world. Just a thought! not especially original but one I find myself musing over again and again when I am doing what I love doing so much. Just occasionally something comes along that puts all you trials and tribulations into perspective. 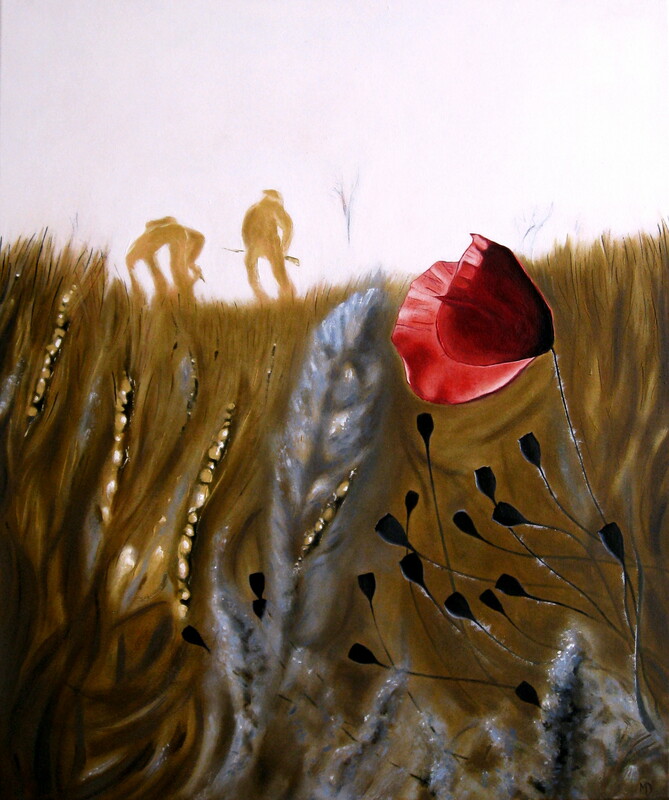 Early last year I was asked to paint something to commemorate the outbreak of WW1 and submit it for an exhibition in aid of Help for Heroes and a number of other military charities. I know there were many & various other commemorative events going on all over the UK but I was honoured to be asked and proud to help out in a small way. The exhibition went ahead in Northampton and was a runaway success – I have just had confirmation from the chairman of the organising committee that over £4000 was raised and is to be presented to the charities next week. Whatever else is going on (or not) in my artistic practice I feel really, really happy and proud that I contributed to such a special cause. The painting I did was sold and the proceeds went towards the total raised, so I am doubly pleased. Needless to say I would be even more keen to help with any similar events that may be planned over the next few years of war commemoration. 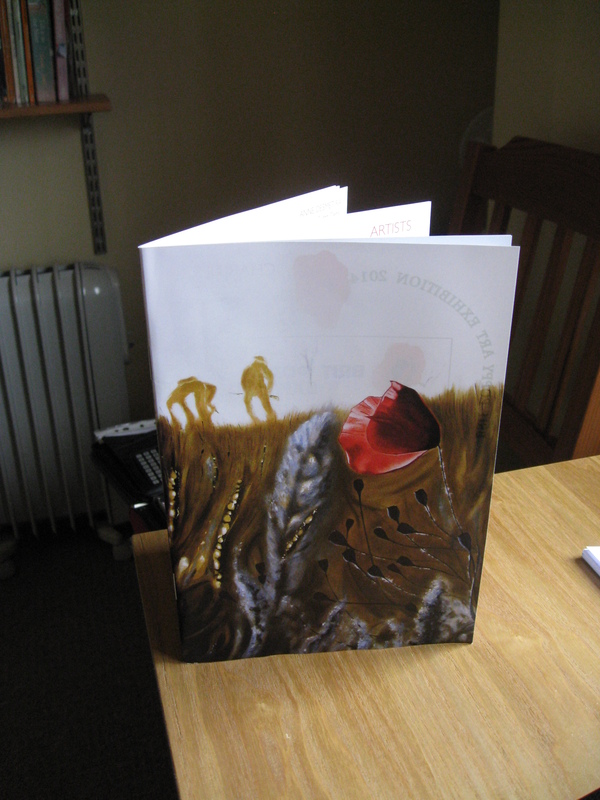 This is the piece I painted – and incidentally the committee were so impressed they used it as the cover for the programme for the event. Chuffed. Well I was getting so bogged down in my own downward spiral trying to re-boot my mojo a bit I thought I should try a bit of plein air stuff, y’know painting outdoors…in public!!. The chance came along recently when artist friend Jen Oldknow started up a group of like minded souls on Facebook and…well that just gave me the jolt I needed to get off my backside and try it. Well nothing else was working anyway! 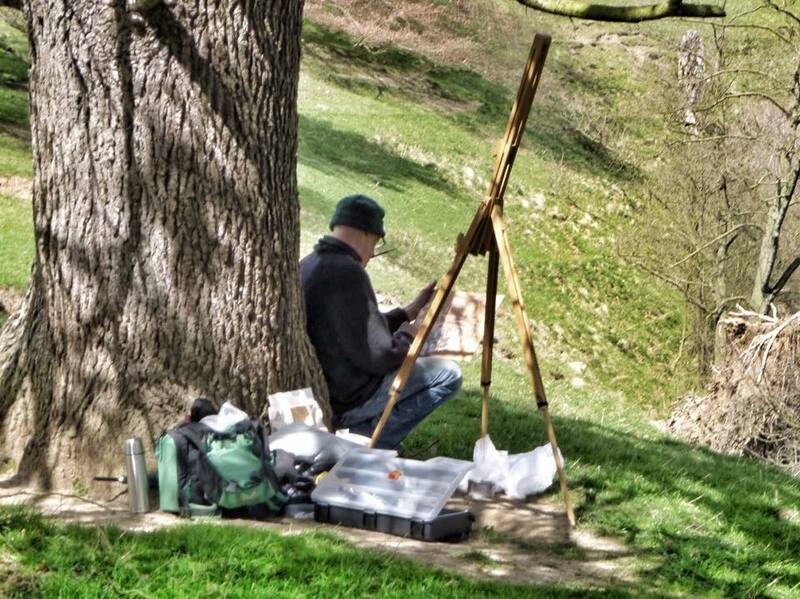 Must admit as a plein-air virgin I was a bit apprehensive. 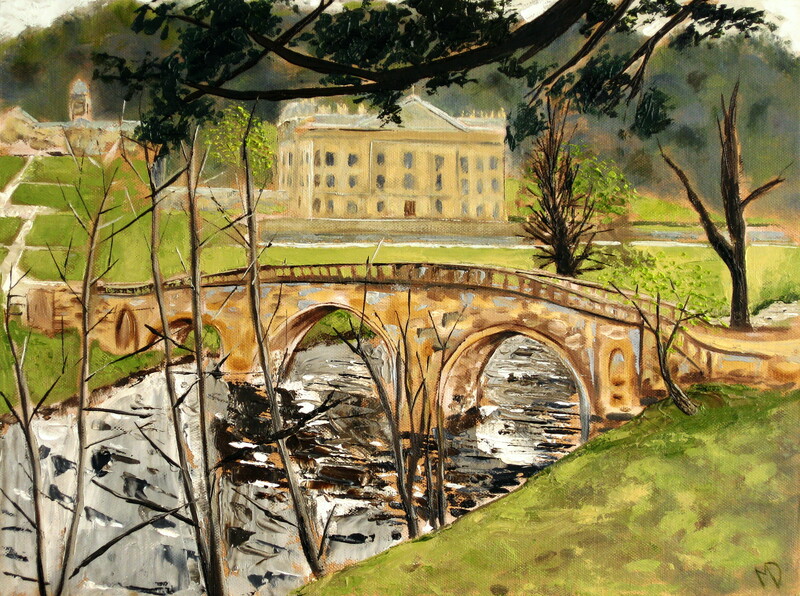 Several of us met up at Chatsworth in Derbyshire last week for a first outing. Well what with the cold, wind, interested sheep and good chance of rain sometime soon something seemed to give and I stopped being so ponderous and anally retentive about my work and actually speeded up. I needed to get something productive done before I froze up and that seemed to have the desired effect. In addition to that, and despite all my earlier misgivings (I always said I was just a studio artist) I also actually enjoyed it. – and this is the result! Much looser and rougher than my usual style. Yes I finally managed to do it!! I’m hoping now it will lead to a break in the logjam and much more work of a similar nature, more fluid and unpolished – just what I wanted. Hope I can carry it over into my studio work too. I am also looking forward to the next trip to Cromford (just down the road) in a week’s time. Yoohoo! !